RAINEY, Henry Thomas, a Representative from Illinois; born in Carrollton, Greene County, Ill., on August 20, 1860; attended the public schools and Knox Academy and Knox College, Galesburg, Ill.; was graduated from Amherst (Mass.) College in 1883 and from the Union College of Law, Chicago, Ill., in 1885; was admitted to the bar in 1885 and commenced practice in Carrollton, Ill.; master in chancery for Greene County, Ill., from 1887 to 1895, when he resigned; elected as a Democrat to the Fifty-eighth and to the eight succeeding Congresses (March 4, 1903-March 3, 1921); unsuccessfully contested the election of Guy L. Shaw to the Sixty-seventh Congress; engaged in agricultural pursuits; elected to the Sixty-eighth and to the five succeeding Congresses and served from March 4, 1923, until his death; majority leader (Seventy-second Congress), Speaker of the House of Representatives (Seventy-third Congress); died in St. Louis, Mo., on August 19, 1934; interment in the Carrollton Cemetery, Carrollton, Ill.
Papers: 1923-1933. 40 pages. In the Herbert Hoover papers. Contains endorsements for public offices. Finding aid in repository. Papers: 1904-1934. 20 containers. Primarily constituent correspondence. Register. Baker, William E. "The Political Career of Henry T. Rainey, 1903-1934." Master's thesis, University of Maryland, 1953. Block, Marvin W. "Henry T. Rainey of Illinois." Journal of the Illinois State Historical Society 65 (Summer 1972): 142-57. ------. 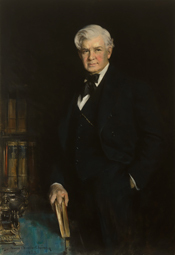 "Henry Thomas Rainey: Some Major Aspects of His Legislative Career." Master's thesis, Illinois State Normal University, 1960. Field, Walter T. "The Amherst Illustrious: Speaker Rainey." Amherst Graduates' Quarterly 24 (November 1934): 22-24. Graff, Helen E. "Henry T. Rainey--An American Statesman." Master's thesis, State University of Iowa, 1933. McCarron, John F. Contested Election Case of Henry T. Rainey vs. Guy L. Shaw. Washington: Judd and Detweiler (Inc.), printers, 1921 [?]. Mumford, William. Contest of Election. Henry T. Rainey, contestant, vs. Guy L. Shaw, contestee. N.p, 1921 [?]. U.S. Congress. House. Committee on Elections No. 2. Contested-election case of Rainey v. Shaw. 67th Congress. Washington: Government Printing Office, 1921. U.S. Congress. House. Memorial Services Held in the House of Representatives of the United States, Together with Remarks Presented in Eulogy of Henry T. Rainey, Late A Representative from Illinois. 74th Congress. 1st session. Washington: Government Printing Office, 1936. Waller, Robert A. Rainey of Illinois: A Political Biography, 1903-34. Illinois Studies in the Social Sciences, No. 60. Urbana: University of Illinois Press, 1977. ------. "The Selection of Henry T. Rainey as Speaker of the House." Capital Studies 2 (Spring 1973): 37-47.